Tarsem's unique visual style was evident in his direction of the video for R.E.M. 's Losing My Religion and again in the neuro-fantasy thriller The Cell. But in The Fall, he pulls out all the stops to create a whimsical tale that is breathtakingly haunting. With filming locations in India, Argentina, Bali, Brazil, Cambodia, South Africa, Chile, China, Egypt, Fiji, Italy, Prague, Romania, Turkey and Hollywood in the good ol' U.S. of A., the film is a gorgeous feast for the eyes. The exquisite production design by Ged Clarke and luxurious costumes by Eiko Isioka hold their own against the exotic scenery. But at the heart of the visceral extravaganza is the tale of a storyteller and his rapt audience. Set in Los Angeles circa the 1920s in a hospital where two patients are recouping from nasty falls (which is the inspiration not only for the title of the movie, but inspires a great deal of the imagery as well...). The storyteller is Roy Walker, a moving picture stuntman who in a cruel twist of fate turns his surname into an antonym when he is paralyzed during the making of a film. The rapt audience is a young migrant worker named Alexandria, who broke her arm picking oranges. Lee Pace, who plays Roy as well as one of the mythic heroes in the story, is as achingly beautiful as the majestic settings for the film. He offers a portrayal of a man who is both charming and manipulative and yet at the same time sad and broken. Any fans of his recent role in Miss Pettigrew Lives for a Day or his turn as the magical piemaker on Pushing Daisies must go see him in The Fall--he is just utterly delicious! Cantinca Untaru is completely enchanting as the plucky Alexandria. 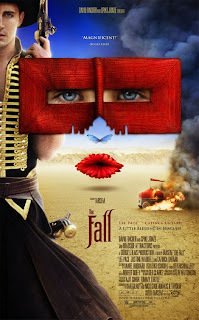 The Fall was inspired by a 1981 Bulgarian film called Yo ho ho, but also seems to take stylistic cues from the photography of Gregory Colbert--with a bit of Cirque de Soleil thrown in to boot. There is a bit at the end that seems needlessly tacked on--turning the story of the storyteller into a story about action hero stuntmen and a dream sequence towards the end that is evocative yet jarring since it greatly deviates from the stylistic sensibilities of the rest of the film, but overall it's a really beautifully done piece of work. Because despite the stunning scenery and sweeping saga, this is really a mesmerizing piece about two broken people who help heal each other.